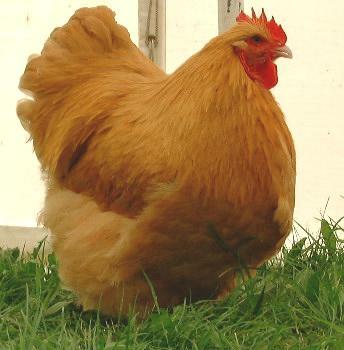 Buff Orpingtons , 3-4 eggs per hen per week. These are the main stock of our rental flock. Orpingtons are big, friendly dual-purpose birds originally developed in the UK. They’re friendly and cold-hardy due to their fluffy plumage. They are so family friendly and are great foragers; meaning they love to look for food in your yard. We know you will love these girls! In very limited quantities: First come, First Serve, 16 weeks of age by Late March and not raised the first few weeks on Non-GMO feed but are on this feed at time of purchase. Black Australorps, 5 eggs per week Australorps are the Australian take on the Orpington breed. They are calm and friendly, and excellent layers of light brown eggs. The Australorp’s exceptionally soft, shiny black plumage has hints of green and purple in the sunlight. They are both peaceful and dignified. Rhode Island Reds, 5 eggs per week per hen. Rhode Island Reds are the official Rhode Island state bird. They were once hugely popular in America, though they declined right along with the small farmer. Today they’re making a comeback due to small flock owners (like us!). They’re the do-everything bird: they lay exceptionally well, they’re valued for their meat, they’re extremely cold hardy, and hardy in general. They are a bit more skittish but are dependable, great layers and are used in the development of many other breeds of chickens. Easter Eggers, 4 eggs per hen per week. Easter Eggers are not a breed, but a variety of chicken that does not conform to any breed standard. They lay large to extra-large eggs that vary in shade from blue to green to olive to aqua and sometimes even pink. Easter Eggers vary widely in color and conformation, and are hardy. They are usually quite friendly to children and humans in general but remember, the key word is “usually”. They are not the same as Ameraucanas or Araucanas which are very flighty, but do have the same blue gene that creates the blue tint to the eggs. Plymouth Rocks, 4-5 eggs per hen per week. Plymouth Rocks are one of the most popular dual-purpose chickens. Their heritage is unclear with reports of different crosses, but what is clear is that they’re very friendly, great layers of large brown eggs and able to withstand cold weather. Though they tolerate confinement, they’re most happy when they get to range freely and we love their black and white plumage! 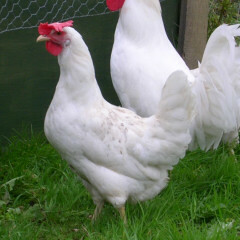 White Leghorns, 4 eggs per hen per week. (Pronounced “Leggern”) Remember Foghorn Leghorn the cartoon? Yep, this bird one and the same. The White is separate from the rest because they lay large, white eggs practically every day! Other varieties aren’t nearly so prolific. Whites are said to be nervous, but can be quite tame at times.